In many schools, it's common to have a generic “MEAL” button that tracks meals sold by eligibility status. À la carte items are usually listed as well, but in many cases in a more generic format like “DRINKS” for example. While this can occasionally speed up serving lines, it doesn’t provide much detailed information for reporting later on. These days, POS menu boards give you the flexibility to track items in as much detail as you want, making it easier to see which items sell best, thus positively impacting your revenue. Try changing your generic “DRINKS” button to something more specific, like “SNAPPLE”. Or better yet, create buttons for each drink flavor, such as “LEMONADE” or "APPLE CRANBERRY”. When it comes to meals, try changing the generic “MEAL” button to “Chicken Patty Meal” or “Pizza Meal”. By doing this, you can see exactly how many Chicken Patty and Pizza meals were sold through your Point of Sale system. Once your menu boards are optimized, you can compare individual items sold to your production records to help with portion control and preparation levels. Additionally, you can view historical counts by item to help with bidding and validating popularity throughout the year. If you're using ‘Offer Versus Serve’ in your meal program, your POS might be able to help. Many systems on the market today are designed to automatically recognize USDA meal pattern rules once all the appropriate items/components that make up a meal are entered. Instead of hitting the generic "MEAL" button, the cashier enters each item on the tray. The system will charge the student à la carte pricing for each one until the meal requirements are met. Then it will convert the individual à la carte prices into one meal price based on the eligibility status. If there aren’t enough items on the tray, the point of sale will catch it. If there are too many, it will charge for the extras. Not only does this work very well for Administrative Reviews, it ensures that any extra items that should be paid for are not being missed as part of the meal. When setting up your menu boards, you can use generic component buttons like ‘Entree’, ‘Fruit’, ‘Veg’, ‘Milk’, ‘Grain’, or you can be more detailed with these buttons if you are trying to track which vegetable or fruit is more popular with your students (the latter option is ideal, but not always possible). When configured properly this process is very dynamic, allowing cashiers to enter items within seconds. 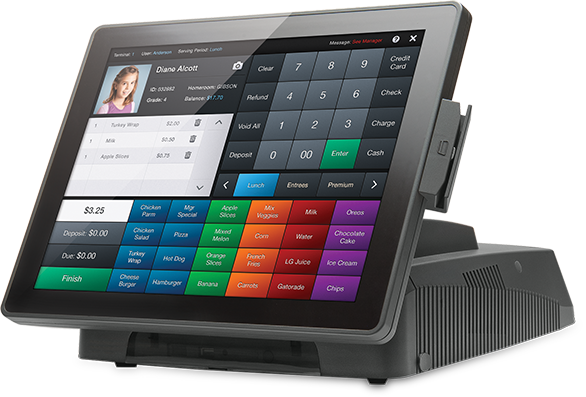 In fact, I’ve found that once a cashier gets used to where the buttons are, usually it's the students that are the holdup. Plus, you'll get the added benefit of much more detailed reporting. Also, by setting up your menu boards this way, districts that use an online payment service like MySchoolBucks allows parents to see exactly what items have been served for lunch. This helps promote healthy eating and transparency in school operations. For example, if a parent notices that vegetables are never taken by their student, it could inspire a conversation at home to try to get them to try something new. Moving the needle in any way toward a healthier student is a win! Keep in mind that these suggested changes for your serving lines don't have to be “all or nothing”. You may only see value in tracking this level of detail in one school to start, or even just one serving line. Since these changes can typically be implemented on a line-by-line basis, you can experiment and determine what works best for your operation.